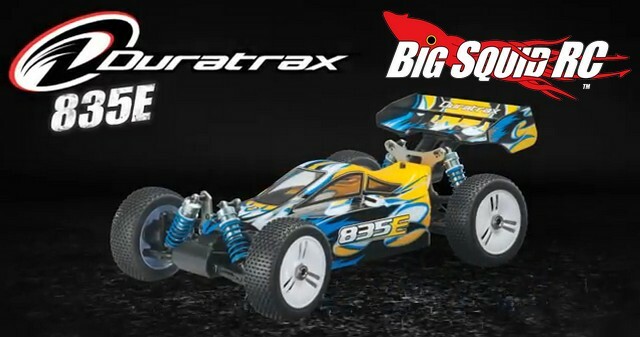 Video – Duratrax 1/8 Scale 835E Brushless 4WD Buggy « Big Squid RC – RC Car and Truck News, Reviews, Videos, and More! Duratrax has an affordable bash machine out right now called the 835E buggy (street price $399). It comes with waterproof brushless power and the great handling characteristics of a low slung 8th scale buggy. Even more importantly for the bashing crowd it comes with the Duratrax 1 year Stress-Tech Guarantee. If you break a Stress-Tech plastic part Duratrax replaces it free for the first year, great news for drivers that like to bash hard. To get more information on the Duratrax 835E simply click on THIS LINK, for more information on the Stress-Tech Guarantee CLICK HERE, and to read even more Duratrax news HERE is the link you want. Check out the video below to see the Duratrax 835E in action, don’t forget that comments are open so let your voice be heard.